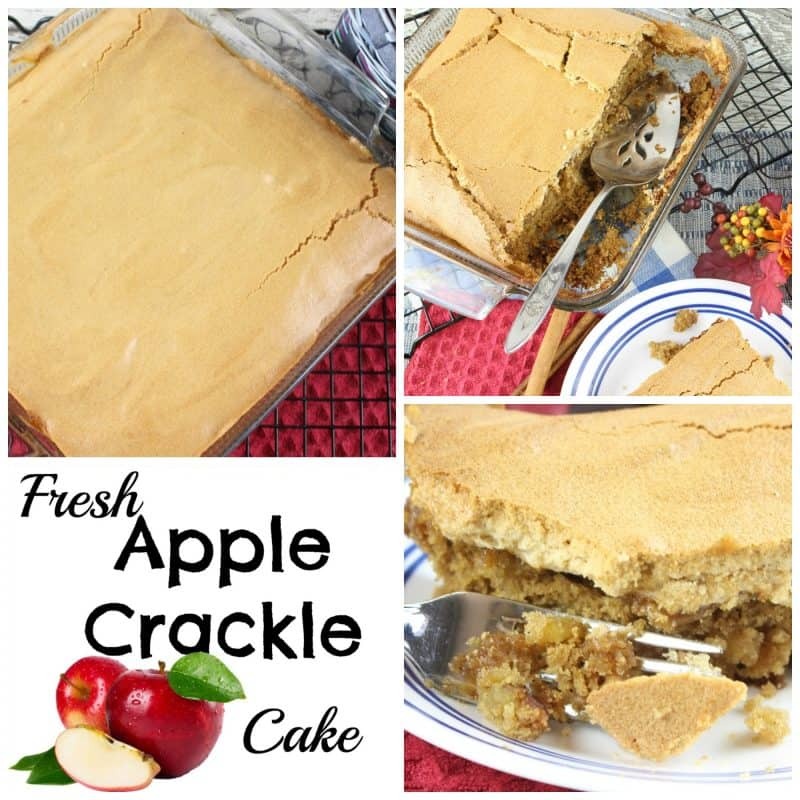 Apple Crackle Cake is a moist fresh apple spice cake topped with a crackly, melt in your mouth layer of brown sugar meringue. I love a delicate meringue made with brown sugar. It just melts in your mouth and fills your tastebuds to overflowing. The only thing that makes it better is if it’s served atop an apple spice cake, with big pieces of juicy apples and spices just waiting to party with that meringue! A note to those lacking a sense of humor: I’m kidding. There are hardly any weeks at all in which I find myself needing to hide bodies. 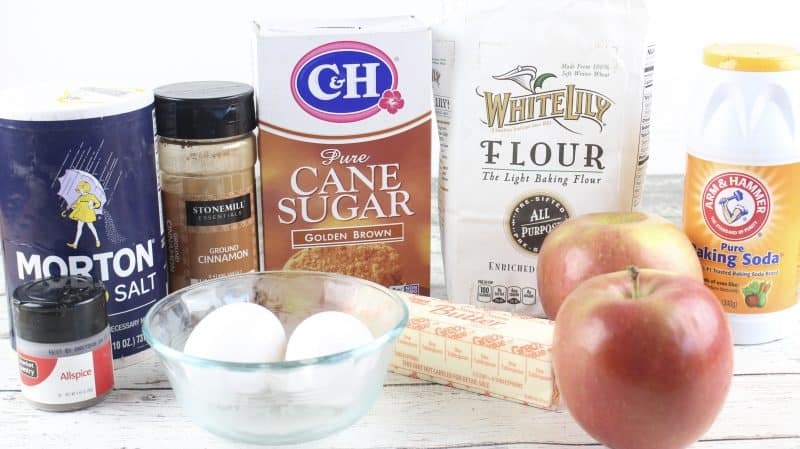 For the cake you’ll need: butter, brown sugar (light or dark, your preference), eggs, all purpose flour, baking soda, salt, cinnamon, allspice, and apples. You’ll also need additional eggs and brown sugar for the meringue. Begin by making your meringue. In a large mixing bowl beat egg whites with an electric mixer until stiff peaks form. Add brown sugar and stir by hand until well combined. In another mixing bowl, place softened butter and brown sugar. Beat with electric mixer until fluffy. Add eggs, baking soda, salt, cinnamon, allspice, and diced apple. Beat again until fully incorporated. Add flour and beat until combined, scraping down sides as needed, about one minute. Batter will be thick like homemade cookie dough. Uh oh. Now I got you thinking about cookies. Focus, focus. We can make cookies after we get the cake in the oven. My vote is for Tea cakes! 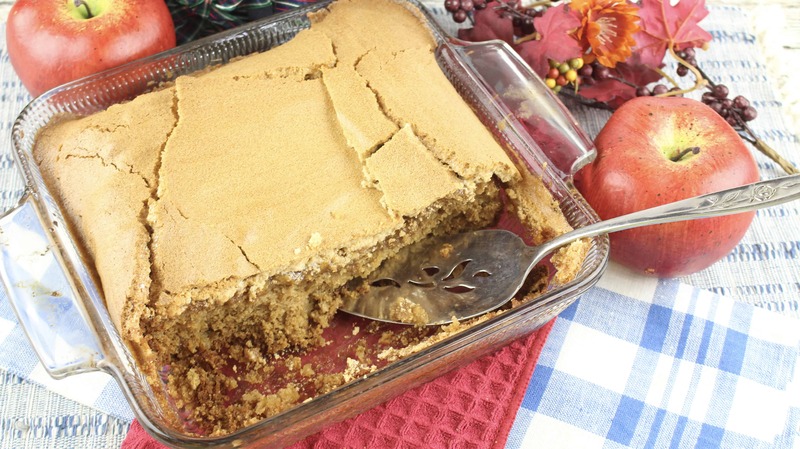 Spoon and then smooth batter into a lightly greased 8×8 baking dish. Pour meringue over top and spread to cover, making sure to touch the sides of the pan with the meringue all around. This keeps the meringue from pulling back and shrinking as it bakes. Bake at 350 for 40-45 minutes, or until meringue is lightly browned and set on top. And enjoy the old fashioned goodness! In a large mixing bowl beat egg whites with electric mixer until stiff peaks form. Stir in brown by hand until well combined. 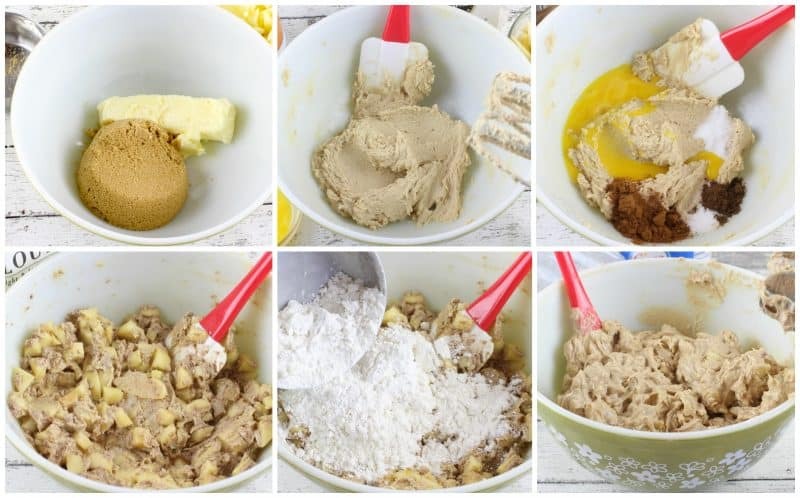 In a separate mixing bowl, place softened butter and brown sugar. Beat with electric mixer until fluffy. Add eggs, baking soda, salt, cinnamon, allspice, and diced apple. Beat again until fully incorporated. Add flour and beat until combined, scraping down sides as needed, about one minute. Batter will be thick like homemade cookie dough. 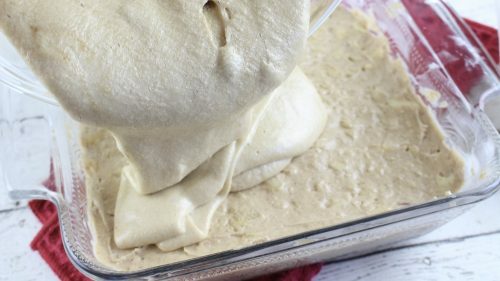 Spread cake batter into a greased 8x8 baking dish. Pat it down smooth and even on top. Spread meringue over all. Bake at 350 for 40-45 minutes, or until meringue is lightly browned and set on top. Scrumptious! Love the meringue topping. I made this last night to take to church this morning. The cake didn’t get done and with the meringue it was too sweet. When we got home I took the meringue off and cooked it for another 30 minutes to cook the cake. What do you think I did wrong? I cooked it for 45 minutes last night. the same thing happened to me just today! I am wondering what I did wrong…I followed the recipe exactly. oven, meringue a disaster and the cake was not cooked. It still had about 15 minutes bake time left but the meringue was burnt. Don’t think I’ll try this one again. I thought it was rather time consuming. 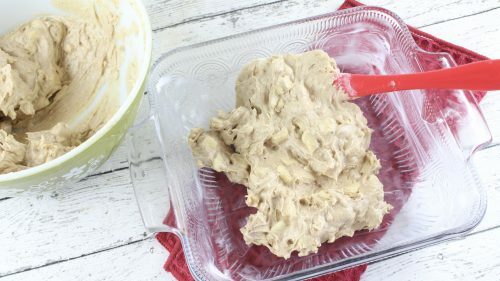 I’m one of the laziest cooks around these parts – can you do this with a cake mix? What are the substitutions? Lol, I love your comment! I’ve gotten quite lazy with my cooking too as I’ve gotten older. 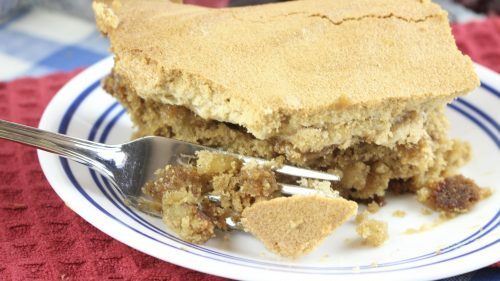 I find that cake mixes make some really tasty deserts! Ha, there goes my lazy…desserts not deserts! Already getting your recipe emails! I missed out on those some way & would love to have them. They probably went to your spam folder because anytime I offer something to new subscriber, I first sent it to all of my subscribers at least two times. I would go to the bottom of any of your emails from me and click “unsubscribe” and then come back and subscribe again. Once you confirm in that first email you will receive them in the next 🙂 Thank you! 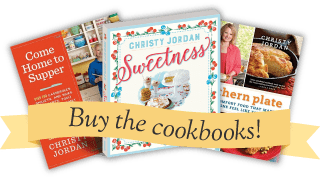 I’d like to receive the free cookbook/cards. I missed the email. Thanks!! Hi Donna, are you talking about the ones from Silver Dollar City? THIS cake looks super yummy!! But what prompted my comment today is the meme on the email about “shout out to all the plants growing through concrete”!! It made me laugh because usually we think negatively of them–now we can appreciate their strength. And ThEN I related it to myself,,not to be a sob story,, but I’m getting chemo treatments right now, and I thought that’s about what it’s like—the chemo is my concrete. But I can grow through the cracks!!! THtank tou for your uplifting spirit. And your humor. Blessings to you Karen. It must really feel like you are going through concrete right now. I have never had chemo, but cared for many patients who were. May God give you strength for this journey. I am about to start chemo as well. Just finished my 10 rounds of radiation yesterday. Thank The Lord I have that behind me. Now we’re fledging forward. Karen, I wish you a successful round of chemo… keep on, keepin’ on, lady. Hugs to you! Hi Karen!! You are so right, you CAN grow through those cracks!! I will add you to my prayer list! Oh my!! I have never seen a recipe like that! It sounds amazing! Thanks for sharing. Thank you Pam, I hope you get the opportunity to try it soon!! Thank you for sharing Barbara, I can’t wait to hear how you like it!! This looks like just the treat I need to fix this weekend! My hubby is building a storage shed “in his spare time” and has a couple of helpers lined up to help with roofing this weekend…I think “the guys” would greatly appreciate a treat like this for dessert!! Thanks for your wonderful recipes, your cheerful inspiration and, most of all, for just being you!! You are a bright spot in my day each time I get your emails! Blessings to you! Thank you so much Kari!! I hope everyone enjoys the cake. What are you fixing for the meal?? 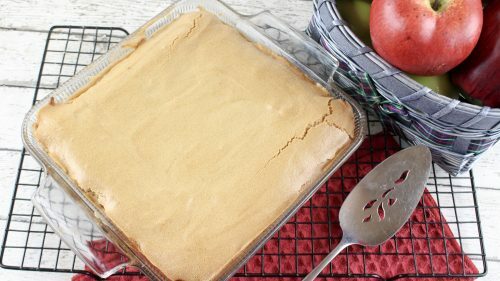 If I choose not to add meringue topping, do I need to change temp or baking time? Thanks so much. It will be about the same, just know it’s done with it is lightly browned around the edges and springs back in the center when pressed. Gonna try this cake. Sounds amazing. Thanks Christy. Thank you Anita, I hope you get the chance to try it soon!!! Oh Christy, how I do love thee… great recipes, and since I DO have a sense of humor, big smiles. : ) You’re the best! I think this cake would hit the spot tonight. Better get it through the oven before I start the pizzas going through! Thanks!!! I don’t have allspice, could I substitute an equal amount of ground cinnamon for it? What would you suggest? Christy! I wanted a good dessert like this to take to the seasonal harvest helpers at my husband’s workplace. You always come through for me, thanks so much! BTW, are you doing a gift guide list this year? Can’t believe we’re already this close to Christmas. Thanks again! I want to bake this in a 9×13 pan. Is it as simple as just doubling the ingredients or should the baking temp or time be adjusted? With the meringue on top it would b impossible to check the cache to see if it’s done. I’m taking it to a ladies gathering at church tonight and don’t want any “surprises”!